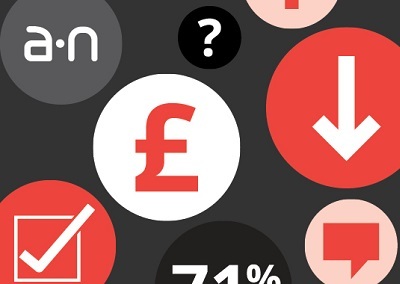 a-n has launched the Exhibition Payment Survey 2018, a new sector-wide survey to collect essential data and produce a benchmark for Exhibition Payment. Aimed at both artists and organisations (with different sets of questions for each), the survey is the next step in securing fair payment for artists and the latest focus of a-n’s Paying Artists Campaign which established sectoral support for exhibition payment with the publication of the Exhibition Payment Guide in 2016.
a-n’s Exhibition Payment Guide sets out best practice for establishing and agreeing exhibition payments for artists. For use by artists and organisations, it is endorsed by Arts Council England, Creative Scotland and Arts Council of Wales and was published following a two-year consultation. Last year, a-n set up the Paying Artists Working Group to implement and develop exhibition payment over the next four years, and outcomes of the survey will inform both the work of the group and a-n’s continued advocacy around fair payment to artists. Partners from the Paying Artists Working Group are encouraging artists, gallery directors, and curators to complete the survey to ensure both artists and organisations experiences are taken into consideration. Artist and Paying Artists Working Group member Rachel Maclean said: “If artists are not paid or paid properly then public art institutions have to rely heavily on individuals being from wealthy backgrounds or having a significant market value. “This is having and will have a damaging impact on accessibility and diversity in the visual arts and increasingly means that the market dictates who and what will be shown in public institutions. Public art institutions should reflect the whole of our culture, not an elite subsection of it. Peter Heslip, Director, Visual Arts and London for Arts Council England commented: “Paying artists is essential to the diversity and sustainability of the arts and culture sector in the long term. And speaking on behalf of Working Group member Plus Tate, Modern Art Oxford Director, Paul Hobson, added: “All publicly funded visual art organisations showing contemporary art have a responsibility to champion best practice in relation to artists. Outcomes of the Exhibition Payment Survey 2018 will, for the first time, establish a benchmark for actual payments made to, and received by artists, from exhibitions across the UK. The data collected (and that from a follow-up survey to be run in 2020) will mean future editions of the Exhibition Payment Framework within the Exhibition Payment Guide reflect artists’ experiences, and the capacity of organisations to make fair payments informed by regional and national data and practice. To encourage contributors to the surveys to be as open as possible in their responses the data collected will be aggregated and anonymised to protect both individuals and organisations. General findings from the survey will be published later in 2018. Click here to take part in the survey if you are an artist. Click here to take part in the survey if you are an organisation. The survey closes on Friday 18 May 2018.